In wine terminology, the sugar content of wine is referred to as residual sugar and is measured in percentages. All red wines, whether sweet or not, have a residual sugar level close to zero. The difference between a sweet and a dry red wine is the level of tannins. Tannins are the acidic agents produced by the grape skins that cause your mouth to pucker and feel dry. Wines with less tannins appear sweeter because the fruity flavors are more pronounced due to fewer tannins. Any wine labeled Merlot is usually a sweet wine. Merlot is the variety of grape used to make the wine and is now grown all over the world. Merlot grapes are gentle in flavor and lower in tannins than most other grapes, giving off a smooth taste full of fruit flavors, including plum and berry. While not overly sweet, Merlot is a much smoother wine than a highly tannic wine such as Cabernet Sauvignon. Merlot is a great accompaniment to both red meats and white meats such as turkey, pork chops and chicken. Chianti is a blended wine from Italy consisting mostly of Sangiovese grapes with variant styles mixed with Canaiolo, Colorino, Cabernet Sauvignon and Merlot grapes. Only Chianti made from grapes grown in the Chianti region can be marketed as Chianti. Like Merlot, Chianti is fruity and low in tannins and is therefore sweeter in taste than dry red wines. While sweet, Chianti tends to have a spicy flavor wrought with hints of coffee and tobacco, with hints of cherry and plum. The spicy fruit flavors go well with most pasta and seasoned meat dishes. 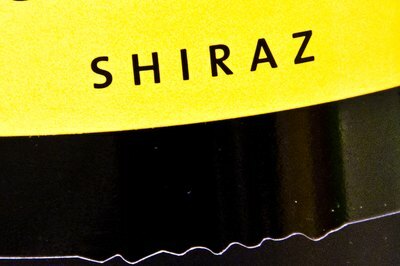 Shiraz, made from the Syrah grape, is produced solely in Australia, while the rest of the world refers to wine made from the Syrah grape simply as Syrah. Like Chianti, Shiraz is spicy with full-bodied fruit flavors yet low in tannins and soft on the tongue. Though light, Shiraz pairs well with a variety of bold foods including rich red meats and spicy cuisines such as Mexican or Middle Eastern. Dessert red wines are among the sweetest wine varietals available due to the process of fortification. Most dessert wines like Port or Sherry are not pure wines but rather are blended with liquor. Port, the sweeter of the two, is made from sweet grapes from Portugal's Douro Valley. After only a few days, the fermentation of the wine is stopped and brandy is added to create the distinct sweet, thick and rich characteristics along with the accelerated alcohol content. Due to the halt in fermentation, the natural sugars in the grapes do not fully ferment and thus remain in the wine. Sherry is also fortified with brandy; however, the grapes ferment fully before addition and is thus less sweet than port. Dessert wines are usually served as an aperitif before a meal, alongside dessert, or after the meal as the digestif. Easy-drinking and typically low in alcohol, sweet white wines come in many different varieties. Learn more about sweet whites with this introduction. What Are the Driest Red Wines?